Ants are very tiny insects that live in colonies. There are many different methods to get rid of ants! We use several methods to eradicate and prevent future infestation of ants without causing any harm to your family, your pets or the environment. Carpenter Ants can be very destructive to a building, and are one of the toughest problems to deal with. If you find ants in your house, do not hesitate! Contact Pest Pro right away from your appointment and consultation and we will eliminate the infestation. 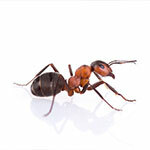 Pest-Pro Specialists can come periodically to monitor your home and help prevent an infestation of ANTS.